George Rodrigue entered two art contests in his life and failed at both. By ‘failed,’ I'm not talking about losses, but more significant that he was disqualified or learned a hard lesson about cheating. “Nothing in life is fair,” my mother used to say, and maybe she was right. But in the end perhaps that's not a bad thing. In George’s case his contest experiences taught him life lessons; they helped him understand people and, most important, that no one reaches their star by proxy. Either you work hard and make it on your own, or it doesn’t happen. The first contest George entered was in 1954 at the Sears Roebuck Catalogue Store in New Iberia, Louisiana. In those days, according to George, the Sears store was nothing more than a small room with a row of catalogues and a woman behind the desk. In an effort to widen its reputation beyond automobile tires, Sears hired actor Vincent Price as their cultural ambassador. He traveled across the country with art exhibitions for the store. It was one of these shows, in Baton Rouge, that first exposed George a few years later to paintings by professional artists. At age nine, recently recovered from polio, young George wanted nothing more than to win the child’s tool set offered as a prize. His mother, frugal since the Great Depression, was not fond of gifts, and if he didn’t win it, he knew he would never have one. From an early age, if George wanted something beyond necessities such as food and clothing, it was up to him to buy it. By the time he was a teenager he earned money by working in his father’s tomb business and by selling his paintings of swamp monsters. 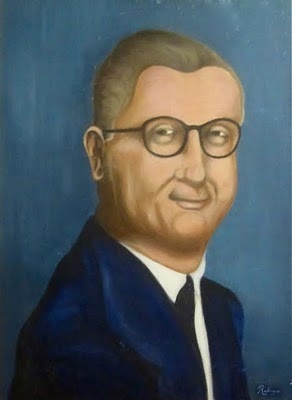 He also took the occasional portrait commission, until 1959, when the director of the local funeral home, George Burgess, refused to pay the agreed-upon price of fifty dollars. For George, at age fifteen, this was a hard lesson learned, and the Burgess portrait hangs in his studio today, lest he forget. He didn’t win the tool set. Rather, the boy who sat behind him in the third grade and who “couldn’t color at all” took it home. His aunt, the manager at the Sears Roebuck Catalogue Store and the contest's only judge, presented him with the prize. 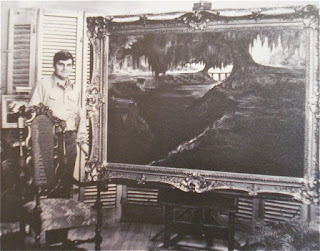 Ten years later, in his early twenties, George Rodrigue entered his second and final art contest. It was in Morgan City, Louisiana, where he was disqualified from the start because the contest’s organizers thought he passed off antique landscape paintings as his own. In other words, they assumed he cheated. 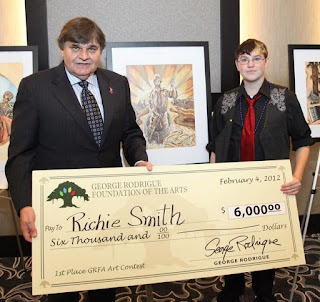 It’s ironic, given these unpleasant experiences, that George launched in 2009, through the George Rodrigue Foundation of the Arts (GRFA), an art contest for Louisiana high school students. 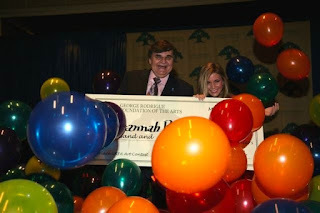 With sixteen winners and $35,000 in scholarship awards, the first contest was an enormous success, as rewarding for George, I believe, as for the winners. As a result, the now annual contest includes higher scholarships and cash awards, attracting hundreds of entries from across the state. Remembering the rigged Sears contest, he avoids judging, ensuring fairness as much as possible with guest judges and nameless entries. Remembering his own academic struggles, he eschews G.P.A. requirements, test scores, and declared majors, hoping all juniors and seniors in Louisiana, regardless of their grades, will find confidence in their creative abilities and give this competition a try. George visits with the winners at a luncheon in their honor and follows their progress during the year, hosting an art show of their works within our foundation’s Education Center. The exhibition travels to several venues throughout the state, including in the past the Louisiana Governor’s Mansion in Baton Rouge, the Ogden Museum of Southern Art in New Orleans, and the Masur Museum in Monroe. The 2013 GRFA Art Contest celebrates “Louisiana’s Culinary Heritage,” as participants create food-related artwork. 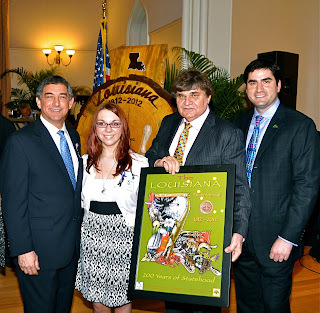 Partnering with the Louisiana Restaurant Association Education Foundation (LRAEF), the contest culminates with presentations of $45,000 in college scholarships and awards and, unique to this year, a Fall 2013 cookbook featuring winning entries alongside recipes from Louisiana's greatest chefs. George and I look forward to meeting this year’s winners at the GRFA Art Contest Awards Luncheon at the Sheraton New Orleans Hotel, March 23, 2013. 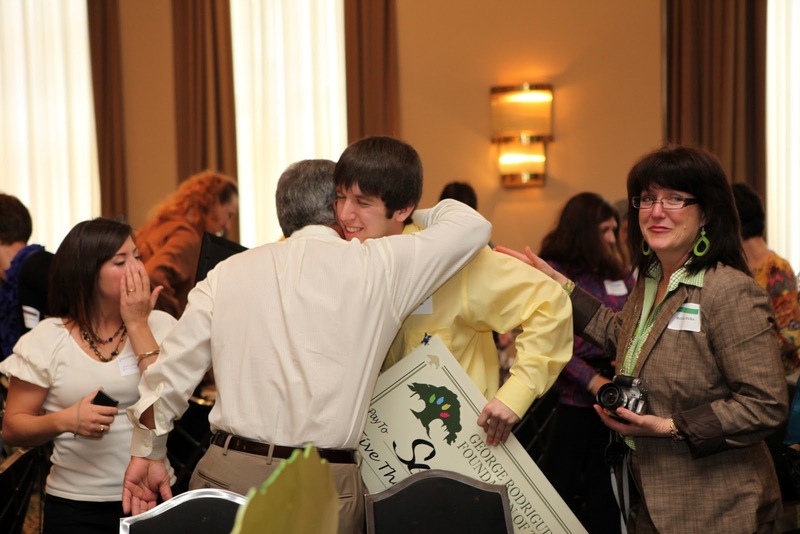 For George, each year grows in meaning, as we attract more entrants and increase scholarship dollars. In addition, the school with the most entries receives one year’s worth of art supplies through George’s Art Closet, further encouraging participation. This is a long way from those early art contests when young George Rodrigue learned hard lessons, now put to use in helping students. A small corner of the world where everything is fair. Unbearably good, just unbearably good. I love that thought, Patty- and so would my mother! Great to hear from you, Cherry, from across the ocean! What a wonderful program for encouraging young artists at so many levels - educationally, personally, and socially. The vibrancy of the gatherings pictured in the video tell the story of how life giving this investment is to contestants and I am sure, to their families. I am so impressed with the foundation, the art closet, etc. and the way you have partnered with other organizations and private businesses. You have been an instrument of "spreading the wealth." Cudos to all of you involved in these endeavors. Thank you, Cityfisher. George and I cannot emphasize enough that the foundation is the best thing we've ever done, now taking up far more of our energy than the galleries. The kids make it all worth it, as we see the real difference the arts can make in schools- and in lives. And yes, we are very fortunate to have some wonderful partners not only within Louisiana, but in other states as well, notably the THEA Foundation in Little Rock, and the Mattie Kelly Foundation on the Florida Panhandle. And the contributions from individuals, companies, and other non-profits make it all possible. We hope to keep making it better and better. This is another reason why George Rodrigue is my art hero. Kudos to him! I was devastated when, in the throes of grief from the death of my beloved cat, I painted a decent watercolor of "Mess." I just knew it would be featured somehow at the St. Tammany Art Association. When it was rejected, I felt completely incompetent as an artist. Judged and juried art contests are at the whim and taste of those doing the judging/jurying. When, as the art teacher at First Baptist Christian School in Lafayette, LA, I was told by a student,"you just like it 'cause it's weird, Mrs. McGlawn," I felt a certain victory. I was not judging anything at that time, but merely complimenting a piece. That same year, my first and second graders created a "Blue Dog" pinata. Somewhere there are pictures! Wonderful stories, Nita. Thank you for sharing. It's interesting-----I judged an art contest at a school in New Orleans recently and not only felt unqualified (I brought along local artist Mallory Page to help me out), but also a real desire to award everyone! Personal expression is just that, and ranking it seems incongruous to the notion of art. That said, I sure love that through our contest we not only see hundreds of incredible entries, but also we meet and honor 20 students each year, along with their families and art teachers. If only we could meet them all! From this post I wandered over to the foundation site and watched the four of you interact with schoolchildren. It was a delightful presentation. If you get bored one day, maybe you can tell us how these "paint and talk" shows got started and how these interactions have influenced y'all. I truly expect someday soon to hear a young artist say that she was inspired by a visit from George Rodrigue. Some of the oddest things start you on a path you hadn't planned to take. For example, I first began to read about George because I thought some fool had spelled his name wrong. (my birth name is Rodriguez) And I continue to do so because you are peeling the onion that is the artist. Thank you so much for sharing, Gwyn. I love to know that people stumble on us and STAY! George and I began the painting demos in the late 90s while on a national book tour, and we really honed them during Shreveport's Red River Revel Arts Festival, where we held student workshops beneath revival-like tents on the grounds! It was a lot of fun and every year attracted more and more families. These days we don't do quite as many, simply because it's hard on George. (You're correct- I should blog about this and will.) The demo has morphed into more of a casual sharing without a full painting. Oftentimes George uses a dry-erase board, and he tag-teams with me on questions and history, so that he doesn't get worn out. I can't speak for George, but I know that for me, looking in the faces of the crowd- children and adults- is extremely rewarding. We've yet to put someone to sleep! And we often go way overtime with questions. I love working other artists and their works into the presentation, hopefully sharing the arts and art history as a viable part of daily living (as it is with us). George's mother never wanted him to be an artist. She died at age 103 still wanting him to "get a real job, like with the telephone company." (see the story "The Artist's Mother" under EARLY YEARS on the right side of this page). But through these presentations and especially the art contest, we've seen parents not only support their children in the arts, but also speak of their accomplishments with pride. I know that makes George very happy. Competitions and contests never seem to really be about the work. So impressed with George's foundation and the fairness of it. Kudos to him. I'm reminded of my science teacher in middle school who wouldn't hang my drawing of the middle ear because she was convinced in her mind that I traced it. Far from the truth as I never trace when I create. Those are the kinds of things you never forget. I love George's painting style. I wish him many more years of creating! Keep in mind, Nita, that he was untrained and only 15. At this point, he was unaware of any famous artists--- or for that matter, of any artists at all. The only original paintings he had ever seen were his own, and he had yet to see an art book of any kind. That makes him a genius in his own time. I like the stylized portrait.